One of the most important functions of the skin is protection. It prevents harmful pathogens and toxic substances from entering the body. Unless there is a cut on the skin, nothing can penetrate the skin as this layer assures the protection of different inner parts as well. Therefore, our skin is deemed as our body's first line of defense. This largest organ of the body resists the absorption of water when we are in rain. This resistance is because of the outer most part of the skin which is known as epidermis. The health of epidermis is utterly necessary as it also fights bacteria, virus and other harmful germs. Our skin helps our body maintain a constant internal temperature. When the temperature of the environment rises, the blood vessels present in the skin dilate. In this way, more heat is lost from the body. On the other hand, in response to a cold environment, these blood vessels constrict, thereby cutting down the body's heat loss. Sweat glands present in the skin also play an important role in the regulation of temperature. More sweat is produced when the temperature of the surroundings rises. The evaporation of this sweat from the skin creates a cooling effect. On the other hand, hair follicles help maintain the body's temperature when it is exposed to a cold environment. When the hair stand on end, a phenomenon more commonly known as goose bumps, air is trapped between them acting as an insulator to prevent the loss of heat. Our skin acts as a barrier to prevent the loss of water from the body. The human body is comprised of 60 to 65 percent of water and maintenance of water level is necessary for the survival of our body. 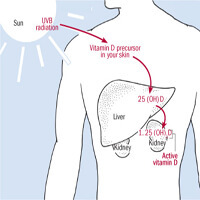 So, skin performs this action and helps us to prevent dehydration which can prove lethal sometimes. Through the production of sweat, the skin helps our body get rid of toxins, such as urea. To maintain optimal health, it is necessary that a human being should have a healthy skin. If functions of skin are not performed properly because of illness or any other reason, the buildup of toxic material can cause loss of skin elasticity, increase in wrinkles or blemishes and cause skin cancer in some cases. Our skin contains a substance called ergosterol, which is responsible for the synthesis of vitamin D. On exposure to sunlight, ergosterol is converted into vitamin D2 which is one form of five types of vitamin D. Vitamin D is a steroid vitamin and it promotes the absorption of calcium and phosphorous together with their metabolism.